1. Studied M. Sc(Tech) with Specialisation in Electronics, a 3-year industry oriented program, at Regional Engineering College, Warangal, during 1977-80. Further, during the Post Graduation exposed to courses like Engineering Drawing, Workshop Practice, 32 Weeks of Industrial Training and I had carried out the Dissertation work, for One Full Semester, at Central Electronics Engineering Research Institute (CEERI), Pilani, Rajasthan. 2. Obtained Ph. D from the erstwhile Regional Engineering College (now NIT), Warangal, under the faculty of Engineering and Technology, in the year 1987. A novel technique is developed to diagnose Congestive Heart Failure (CHF) through the 'dual scale entropy analysis' of Heart Rate Variability (HRV). This technique is able to clearly discriminate the CHF cases from the old-but-healthy subjects. Further, it requires much lesser data of just 500 samples only(Refer S. No. 2 in the list of Publications). A Pulse Oximeter along with its Photoplethysmographic (PPG) Sensor is designed and developed indigenously. The pulse oximeter is an essential equipment in every operation theater for the determination of SpO2, the saturated percentage of oxygen in arterial blood and it is also used in ICUs. First to detect and report the unusually fast and deep multipath fading occurring in daytime on tropical coastal line-of-sight microwave links, in 1985, and formulated a hypothesis for its interpretation in terms of modified atmospheric boundary layer under sea breeze circulations(Refer S. No. 5 in the list of Publications). 6-Years experience of planning and execution of collaborative research work at multiple locations, involving multiple disciplines and organizations, namely, National Physical Laboratory, New Delhi, LOS microwave links of South Central Railways located in different cities in South India, Dept. of Telecommunication, GOI, India Meteorological Department and REC, Warangal. 9-months as Trainee at Central Electronics Engineering Research Institute (CEERI), Pilani, Rajasthan. Two months as Trainee at Central Electronics Ltd., Sahibabad, UP. Medical Instrumentation, an Open Elective in 3rd Year, 2nd Semester. Physics (Theory and Lab.) for 1st Year. Srinivas and L. Ram Gopal Reddy, 'Reduced Data Dual scale Entropy Analysis of HRV signals for improved congestive heart failure detection', Measurement Science Review, vol. 14, No. 5, pp 294-301, 2014. Srinivas and L. Ram Gopal Reddy, An Efficient and Automatic Systolic Peak Detection Algorithm for Photoplethysmographic Signals, International Journal of Computer Applications, (0975 - 8887), Vol. 97, No.19, July 2014, pp. 18-23. Srinivas, L. Ram Gopal Reddy , 'The Effect of Aging on Nonlinearity and Stochastic Nature of Heart Rate Variability Signal Computed using Delay Vector Variance Method' , International Journal of Computer Applications, Vol.14, No.5, PP:40-44, 2011. Reddy, L. R. G., and B. M. Reddy (2007), Sea breeze signatures on line-of-sight microwave links in tropical coastal areas, Radio Sci., 42, RS4021, doi:10.1029/2006RS003545. Srinivas, L. Ram Gopal Reddy,' Quantifying the effect of aging on the autonomic control of heart rate using sequential trend analysis plot', IFMBE Proceedings, vol. 34, pp 245-248, 2011. Srinivas, L. Ram Gopal Reddy, 'Analysis of degree of nonlinearity and stochastic nature of HRV signal during meditation using delay vector variance method', Conference proceedings: Annual International Conference of the IEEE Engineering in Medicine and Biology Society. 2011; PP: 2720-23. doi: 10.1109/IEMBS.2011.6090746, Boston , USA. S Kuntamalla, LRG Reddy, 'Detecting congestive heart failure using heart rate sequential trend analysis plot', International Journal of Engineering Science and Technology 2 (12), 7329-7334, 2010. Srinivas, L. Ram Gopal Reddy, R. Srinivas, 'Estimation of heart rate variability from peripheral pulse wave using PPG sensor', IFMBE Proceedings, vol. 15, pp 325-328, 2007. Ram Gopal Reddy Lekkala and Srinivas Kuntamalla, 'The Effect of Chi Meditation on the Multifractal Nature of Heart Rate Variability', International Journal of Signal Processing Systems Vol. 4, No. 2, PP: 128-132, 2016. Reddy, L.R.G and Reddy, B. M, 'Terrestrial Microwave Radio Links in Tropics: Some Design Constraints', International Union of Radio Science(URSI) Commission F Triennial Open Symposium on'Wave Propagation and Remote Sensing', Ahmedabad, India, pp 148-152, 1995. Reddy, L.R.G, Reddy, B. M, Dinakar and J. R. C. Rao, 'Statistics of rainfall rates measured over a south Indian state using fast and conventional rain gauges', International Union of Radio Science(URSI) Commission F Triennial Open Symposium on 'Wave Propagation and Remote Sensing', Ahmedabad, India, pp 245-249, 1995. Reddy, L.R.G and Reddy, B. M. , 'Fading patterns and physical mechanisms associated with deep power fading observed on LOS microwave radio links in tropics', Proc. of IEE Conference on Antennas and Propagation, Edinburgh, UK, Vol. 2, PP: 660 '664, ISBN: 0-85296-572-9, 1993. L. R. G. Reddy and B.M. Reddy, 'Some observations on the influence of hydrometeors on line- of- sight microwave propagation at 7 GHz in tropics', proceedings of ISAP '92, Sapporo, Japan, PP: 889-892, 1992. Reddy, L. R. G.,'Some factors affecting the performance of line-of-sight microwave links over the South-Eastern parts of India', International Union of Radio Science(URSI) Commission F Triennial Open Symposium 'Wave Propagation and Remote Sensing', pp. 9.5.1-9.5.6, Bradford, UK, 1992. L. R.G Reddy & V.V. Rao, 'The Tropospheric Radio Propagation Phenomena', Journal of Scientific and Industrial Research, Vol. 47, PP: 507-519, 1988. L. R.G. Reddy et al, 'System Details of Monostatic Analog Echo-Sonde (sodar)', Topical Review on Optical Instrumentation, Instrument Society of India, Spl. Vol., PP 67-85, 1986. L. R.G. Reddy et al, 'VHF Transhorizon propagation studies at Warangal', Indian J. of Radio and Space Physics, Vol. 14, PP: 92-95, Aug. 1985. 1. 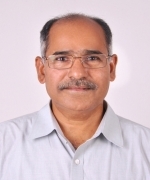 Coordinator for National Seminar on 'Development and Evolution of Advanced Microprocessor Architectures', May 31, 2013, NIT Warangal. 2. Coordinator for ASCI Program on 'Management insight for Faculty of NITW', July 3-7, 2006, NIT Warangal. 3. Co-coordinator for National Conference on 'Physical Sciences and Engineering Education', July 9-11, 1999, REC Warangal. 4. Coordinator for 'Induction program for newly recruited faculty of NIT Warangal', 2006. 7th IEEE International Conference on'Technology for Education', Dec 10-12, 2015, NIT Warangal. National Summit on Quality in Education (NSQE 2015), Sept. 22-23, 2015, Organized by CII, Institute of Quality, Bangalore. *International Conference on Applied Physics and Mathematics, Feb 12-13, 2015, Busan, South Korea. A National Workshop on 'Eco-Friendly Structural Innovations for Sustainable Development', July 18-19, 2014, TEQIP-II, NIT, Warangal. *33rd Annual International Conference of the IEEE Engineering in Medicine and Biology Society(EMBC), Aug 30- Sept 03, 2011, Boston, USA. *15th Nordic-Baltic Conference on Biomedical Engineering and Medical Physics (NBC 2011), June 14-17, 2011, Aalborg, Denmark. *3rd Kuala Lumpur International Conference on Biomedical Engineering, Dec 11-14, 2006, Malaysia. *National Symposium on Instrumentation (NSI-31), Oct 12-15, 2006, ITM, Gwalior. ISSS Workshop on 'Microsystems Technology', Nov 16 -19, 2005, IISc., Bangalore. *Silver jubilee National Symposium on Instrumentation, Nov 8-11, 2000, IISc., Bangalore. XXVI National Symposium of the Optical Society of India on 'Optics and Opto-electronics', Feb 4-6, 2000, REC Warangal. *National Conference on Physical Sciences and Engineering Education, July 9-11, 1999, REC Warangal. National Seminar on 'Technology Development Trends and Challenges', Oct 3-4, 1997, REC Warangal. *URSI Commission F International Symposium on 'Wave Propagation and Remote Sensing', Nov 20-24, 1995, Ahmadabad, India. Brainstorming Session on 'Coupled Phenomena in Geo-Environment', Sept 21-22, 1994, National Physical Laboratory, New Delhi. *IEE 8th International Conference on 'Antennas and Propagation', March 30-April 2, 1993, Edinburgh, UK. *International Symposium on 'Antennas and Propagation', Organized by IEICE, Japan, Sept 22-25, 1992, Sapporo, Japan. *URSI Commission F International Symposium on 'Wave Propagation and Remote Sensing', June 8-11, 1992, Ravenscar, North Yorkshire, UK. *User- Researcher Interaction Seminar on Radio wave Propagation, April 14-15, 1988, Defence Electronics Applications Laboratory, Dehra Dun. *An IETE Symposium on 'Propagation Factors in Space Communication', Sept 8-9, 1987, IIT Madras. *An IETE Symposium on 'Instrumentation ' Recent Trends in Research and Development', June 1982, Calcutta Univ., Calcutta. *National Seminar on 'Improvements to Teaching in Engineering Education', Jan 1982, REC Warangal. *National Space Science Symposium, Dec 1983, Pune University, Pune. * Presented a Research Paper. Chairman, Institute Hospital, 24-05-2017 onwards. Head, Department of Physics, between 23-06-2015 to 03-08-2016 and 05-10-2009 to 09-10-2011. In-charge for Electronics labs during 1999 to 2009. In-charge for Instrumentation lab during 1988 to 1998. In-charge for Industrial Training & Project work placement of M. Sc(Tech.) students during 1995 to 2008. Coordinator for the revision of curriculum for the Electronics stream of M. Sc (Tech), in 2006 and 2016.